Springs Of Water » Anchors and Pedals and Cleats, Oh My! 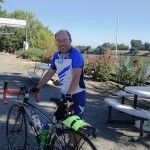 In the last year I’ve really gotten in to bicycling in a big way. As I’ve gotten more into it I’ve made adjustments to my bicycle and with the help of my sister’s family been able to upgrade some components. While out on a ride with my sister and nephew the other day, I had some difficulty with the pedals and realized there was something to be learned from this experience. 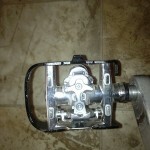 Something that I’ve recently added are clip pedals. It’s sort of a binding and cleat mechanism similar to ski bindings. The advantage to this is twofold. With the foot pretty firmly attached to the pedal, one can get more forward momentum on the upstroke as well as the downstroke. Ordinarily without the clips you’re only propelling as it were on the downstroke. In short; faster speed and more muscles are used. In some ways it’s a little like learning to ride a bicycle all over again.I’ve had some less than graceful moments while learning how to use these things. When coming to a stop, it’s important to unclip and put your foot down before you come to a complete stop. 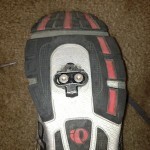 Part of that is making sure that the cleats are firmly anchored in the shoes and the tension on the pedal binding is not too tight. On the ride with my sister and nephew it was a cleat problem that was my undoing. When I had put the cleats on, I hadn’t screwed them in tight enough and the more clipping and unclipping I needed to do the more misaligned the cleats became and the harder it became to unclip. I couldn’t figure out why my foot was feeling in an awkward position the whole time I was pedaling. When we finished the ride, I was able to unclip on the right but my left shoe was very firmly stuck. My sister had to help me take my shoe off and then get it unstuck. The problem was the cleat had become very crooked because it wasn’t firmly anchored. This event could have been disastrous. Falling off a bicycle is one thing, a twisted and stuck cleat could very easily end with a broken ankle. My nephew was able to help me fix the problem and the next time I went riding I did a lot of practicing with clipping and unclipping. When everything is adjusted properly the cleat locks into the binding and turning your foot slightly outward unclips it. Ships need to be either tied down to a dock or anchored a little way off shore otherwise they can drift and end up in places they shouldn’t with potentially devastating consequences. My cleats needed to be firmly anchored in my shoes in order to work properly. As I’ve thought about this, I’ve thought about the fact that in my personal and spiritual life I need to be anchored securely in Christ. 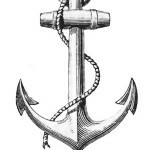 Christ and his gospel are an essential anchor in my life. Without that I could easily go adrift and crash into a reef or a rocky shore. So with that, I give thanks for the blessings of being anchored in Christ.